Don't get nervous though - that's why I wrote this blog post: For beginners to get a basic knowledge of Fruity Loops. The DAW itself is pretty large, and I had to learn how to use the majority of the tools myself (I personally don't even know how to use everything in there yet, haha). But, once you get used to it and know what you're doing, you'll be setting fire to your house in no time. The Step Sequencer is basically where you place your sounds in a particular position (I'll refer to them as blocks). It's extremely simple to use: Left-click to place the sound in that block, right click to remove it from that block. You can have it placed to as many places as you want, or not have sound there at all. The name of the sound on the left is called a channel (basically whatever sound you're using). I believe you can load up to 199 channels, but I highly doubt at this stage you want to use that many sounds. If you're trying to make a new pattern, you go to a bar where it says "Pattern 1", and scroll down to select a free one. Right-click the bar and it allows you to rename, delete, recolor, clone, and more options. Once you've done loading your sound in, you can adjust its volume and panning (where you hear a sound to the left or the right), and also determine its place on the mixer. The mixer is EXTREMELY important when it comes to making beats with FL Studio, it'll make everything much more easier to control. That's where you add different effects (up to ten per sound!) to each channel. You can also adjust the volume, name, color, and other things once you assign a channel to a free mixer state. The grey knob you see on a mixer state when you first open up the mixer controls the volume. Hold it and go up and down, with up increasing and down decreasing the volume. Pick whichever suits you best, there are several choices: Compact, Compact 2, Wide, Wide 2, Wide 3, and Extra Large. You can (re)name your sounds by right-clicking any mixer state, and clicking the "Rename/Color option" will give you a little bar that allows you to rename, color, and symbolize your mixer state. For example, if you have a piano, you can rename your mixer state to "Piano", color it green, and have the little keyboard symbol represent the piano. 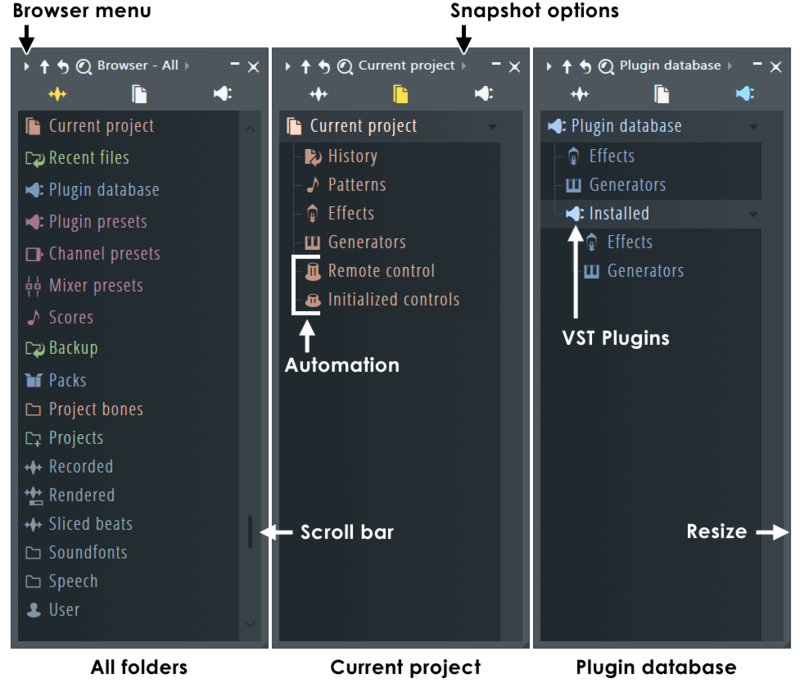 This is where you can choose your plugins and load them to either your mixer or your Step Sequencer. There's a lot of them, and they're pretty easy to open! Just hold one, and drag it into an empty channel, and it should open. Press anywhere in the roll and a key will play; a note will also be placed there. Drag the note anywhere you want, or right-click to delete it (hold the right-click to delete multiple notes). You can extend or shorten each note by going to one end of it; you'll see a double-sided arrow that allows you to control the length of the note, go left or right to your desire. You can drop your melody up a octave or down one by going to the little play button at the top left corner of the Piano Roll and going over to the Edit section. There, you should see two options near the bottom of the list: Transpose one octave down/up. Selecting down will make your instrument sound a lot deeper, and going up will make it at a much higher pitch. The playlist is where you combine all of your patterns and putting them into one song, where then they can be exported and shared. Select a pattern that you want to place. Left-click to put down a pattern, hold it to drag it where you want it, or right-click it to delete it. 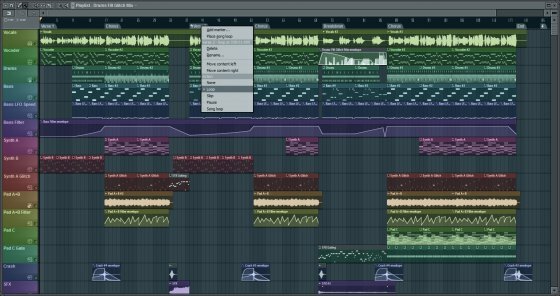 I didn't cover EVERYTHING about FL, but I covered the essentials for you so you'll know what you're doing in the DAW. The Piano Roll, Mixer, Playlist, Step Sequencer, Browser and Plug-In Picker are the most significant features that you need in order to properly make beats. If you ever need more help, there's a manual that Image-Line provided. Just click the question mark in the top left corner when you open up the program and you're given a full breakdown of the program. There's also a number of Youtube videos that you can rely on, so you have a few options to go to. If you have any questions I'm always available to help. Happy producing!